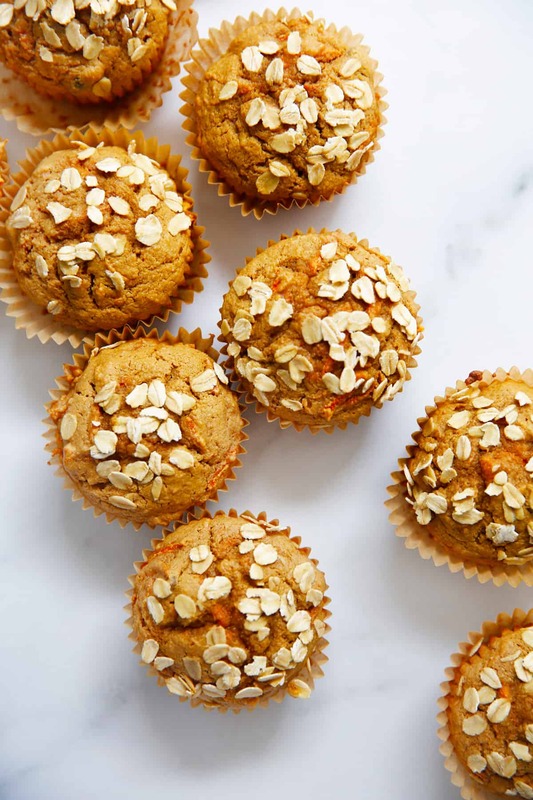 These Healthy Carrot Muffins are made with oat flour and coconut flour, packed with vitamin C rich carrots and raisins and use just one bowl to put together! These gluten free carrot muffins would be a great on-the-go breakfast or snack, will be a hit with picky kids and are 100% nut-free! After perfecting this site’s first gluten-free and nut-free muffin a few weeks ago, we knew we wanted to get right to making another option for our readers with nut allergies. This new healthy carrot muffin is made using oat flour, coconut flour and are nut-free, gluten-free and refined sugar free! They’re made all in one bowl and ready in under 30 minutes! 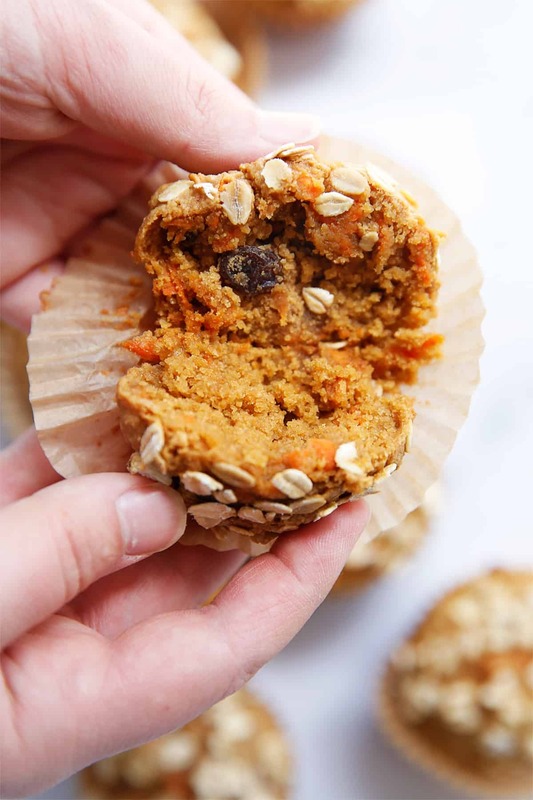 We know despite the pieces of carrots in these muffins, they are picky toddler approved! And they are safe to send to school, since they are nut-free. 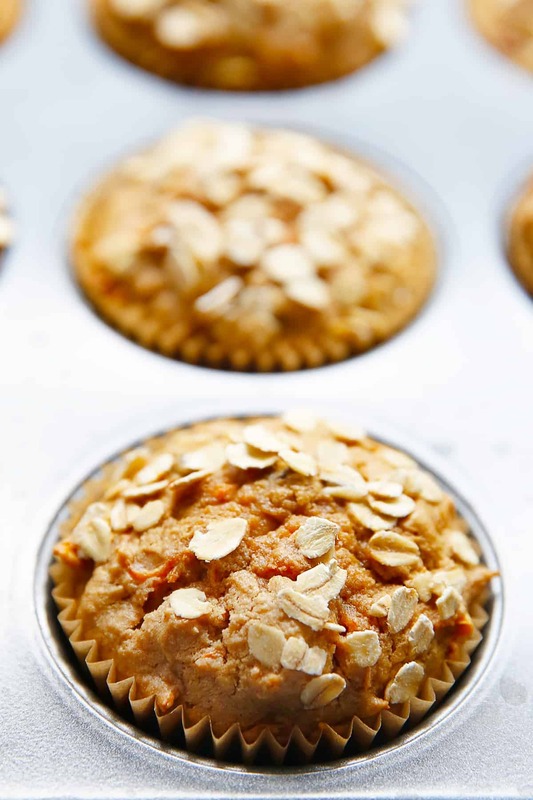 This carrot oat muffin is a great substantial snack that truly everyone will love! How healthy is oat flour? Oat flour is made from rolled oats. If you tolerate this grain, rolled oats are a good source of fiber. We’ve been working a lot with oat flour over the last year, and are impressed with this gluten-free flours ability to replace our typical go-to combination of either almond flour and tapioca flour or coconut flour. This is a good alternative gluten-free flour if there is a nut-allergy, or you are looking to add more fiber to your diet. What kind of oat flour should I use for these gluten-free carrot muffins? As we’ve said in previous oat flour recipes, we recommend you buy premade oat flour. It isn’t expensive and easy to purchase in stores these days. We tested this with homemade oat flour and feel the final result is effected by it. However, if you want to make your own oat flour, you certainly can. We just recommend you try to get it as fine as possible. If you have an electronic kitchen scale at home, it’s best to use it here to measure oat flour. Oat flour can be tricky to measure as it can be easily compacted, even straight from the bag. The same goes for coconut flour because such a small difference in measuring can impact a recipe because it’s such an absorbent flour. So we’ve included the weight in grams here. Any electronic kitchen scale can switch between grams and ounces, and grams are more precise so we’re offering that. If you don’t have a scale: lightly packing the oat flour into the cup measurement gets you as close to the correct measurement as possible. For coconut flour scoop it in the tablespoon and then level it off. We’ve tested storing these at room temperature covered (but not air tight), in an air tight container and in the freezer. They all work! But we prefer to keep these at room temperature covered (in a non-air tight way) for two days at most. The muffins get more moist as the days go on, especially in an airtight container, which can make them feel dense. So if you want to keep them the freshest you can store in the freezer. If you are packing these for lunches for kids, or a snack for yourself, you can take them from the freezer the morning of and place in a container. In an hour or two the muffins are defrosted and ready to eat.